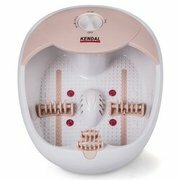 NURSAL is an all-in-one foot spa bath massager designed to deeply relax your feet, and keep them healthy by relieving tension and aches, and improving the flow of blood. The effects of sitting or standing for too long can be detrimental to the health of your feet, subsequently causing tension, joint pain, inflammation and muscle aches. These conditions might seem negligible at first, but they come with significant repercussions if left untreated. Muscle tension and inflammation of the feet might cause serious disorders such as osteoporosis and arthritis due to lack of proper flow of blood to the feet. For this reason, it is imperative that you massage your feet regularly, especially after long hours of inactivity. Based on our experience, no other product offers exceptional feet massage than the NURSAL foot spa. The best part is that anyone can use NURSAL foot bath, as it comes with a unique design to fit most feet. Nevertheless, experts recommend this device to college students, contractors and the elderly considering the fact that they spend most of their time sitting or standing for long hours in school, at work or at home respectively. The foot spa works wonders to relieve numbness in the feet and reduce the effects of long hours of inactivity, for the ultimate massage experience. PROS AND CONS OF Nursal foot spa? – Highly effective in relieving numbness, muscle tension and aches. – Extremely easy to clean and maintain. – Some users have complained that the bubble massage is somehow weak. – The rollers are not motorized. How does the NURSAL foot spa work? The NURSAL foot spa might seem complicated, but it works in a very simple way. The foot bath massager comes with a container that you must fill with water before using the machine. The foot spa also consists of a digital control panel that allows you to set your preferred massage options. 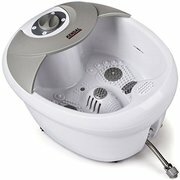 These NURSAL foot bathś options includes heat controls, bubbles and hot water waves. Using the foot spa is straightforward, as the digital control panels consist of all the massage options. – Fill the massager container with cold or warm water up to 4 inches. – Check the container before connecting the machine to a power outlet. – Immerse your feet in the container. – Turn on the foot spa massager. – Set your preferred temperature and massage option. – Once you are done, drain the water using the drainer at the bottom of the container. Features of nursal foot bath? The NURSAL all-in-one foot spa bath massager comes with a wide range of features to give you the ultimate foot massage experience. The NURSAL foot massager comes with digital controls and an LED display. An LED display that allow you to set your preferred massage options according to your precise needs. The NURSAL foot spa offers instant heating, meaning that you do not have to wait for long for the water to heat up. Furthermore, you can control the temperatures from 95 F up to 118 F for consistency and splendid massage experience, without the need to add hot water. NURSAL foot bath offers the option of oxygen bubbles massage and water waves for enhanced blood circulation and improved metabolism. Bubbles massage also relieves muscle fatigue and numbness. The massager consists of 11 mini multi-rollers that provide kneading massage to help relieve soreness, fatigue, muscle tension, aches and joint pain. The NURSAL foot spa is an all-in-one massager, meaning that it comes complete with no additional accessories required. You can use the massager for all your foot massage needs without investing in extra accessories. The health of your feet has an impact on your overall health and general wellbeing. Research shows that the risk of developing various disorders and conditions can increase significantly if blood does not circulate to your feet efficiently. With this in mind, investing in the NURSAL foot spa will always be a wise idea. This massager is highly efficient and very easy to use. Furthermore, it is available at an insanely affordable price tag, making it a must-have for your family and friends. PreviousLeg compression machine or compression boots ? NextWho is a Podologist? What does a foot doctor do?